There is little margin for error in a 100-metre race. A single misstep in the nine or 10 seconds it takes from start to finish can make the difference in finishing on the podium or going home in complete failure. Now multiply that by four, with four different bodies and personalities, and the permutations of what can go wrong become exponential. That’s the 4x100 relay. And all the best sprinters in the world have at one time or another experienced the crushing low of having screwed it up. Glenroy Gilbert is a gold-medallist in the 4x100, and as Canada’s coach, works to avoid any and all miscues. "[The one thing] I try to drill every single time is basic fundamentals,” Gilbert said. “Always going back to the basics in the event itself because it's only through those basics that you get [the] stick around the track. If you forever forget them or for whatever reason you're unable to execute them under the gun or under the stress of a race, it can be catastrophic. “We've certainly had to deal with some of that recently." In 2012 in London, Canada’s team of Gavin Smellie, Oluseyi Smith, Jared Connaughton, and Justyn Warner were denied a bronze medal after what seemed a fraction of Connaughton’s shoe committed a lane violation. But in 2016 in Rio, the Canadians benefited from another nation’s mistake. The foursome of Akeem Haynes, Aaron Brown, Brendon Rodney and Andre De Grasse were awarded bronze after the U.S. team was disqualified for an illegal baton exchange. It was Canada’s first medal in the event since the team anchored by Donovan Bailey pulled a double-double by winning gold at both the 1996 Olympics and the 1997 world championships. Saturday at the IAAF world championships in London, Haynes, Brown, Rodney and Smellie have designs on their own trip to the podium. How they work together and avoid any little mistakes will determine their success. Prior to Degrasse’s last-minute scratch due to a hamstring injury which caused him to miss the world championships, he, Haynes, Brown, and Rodney explained how the slightest slip up can mean disaster for any sprinter. Haynes gets it all started, as he did in Rio when he and the team ran 37.64 seconds to break the national record set by Bailey, Gilbert, Bruny Surin and Robert Esmie in Atlanta in 1996. Haynes sets the pace for his teammates and while a race isn’t won in the first 100, it can certainly be lost. Haynes will have some formidable company in the blocks with American Leshon Collins, Great Britain’s Chijindu Ujah, and Jamaica’s Jevaughn Minzie amongst the possible opponents in the first leg. While the lead-off runner isn’t necessarily a household name in sprinting, his or her impact can’t be overlooked. Overshadowed by Usain Bolt and Johan Blake on Jamaica’s team, Nesta Carter’s personal-best of 9.78 seconds in the 100 is sixth fastest all-time. He was an instrumental part of Jamaica’s relay squads running the opening leg in their gold medal performances in London 2012 and the past three world championships. Nesta Carter shows why an explosive start is so important. In the GIF below, the United States were disqualified at the Rio Olympics after Mike Rodgers passed the baton to Justin Gatlin prior to the latter entering the exchange zone, resulting in a bronze medal for Canada. While Haynes revs up the tempo, it’s Brown’s job to maintain it and set the tone for Rodney and Smellie. The second-leg runner generally runs 120 metres, receiving the baton 10 metres before their 100 begins and handing it off 10 metres after their 100 ends. The majority of this portion of the relay is a straightaway, which is ideally for one of your fastest sprinters. Brown: “I’m getting ready to run, watching the people get in their blocks – anticipation is high. I go down into my [running] stance and know I have the longest leg, so I have to set my team up for success. “I make the first exchange and run all the way through the back stretch and get it to Brendon [Rodney] and that’s when I look around at the rest of the race and see where we are. That’s generally when the separation happens and when you can actually see what position everybody is. So I’ll know pretty quickly if I did my job or not. Besides having great top-end speed, the ability to run the curve is also recommended, and Brown does just that as a 200 runner. The Toronto native is the former Canadian record holder in the latter and was 0.05 seconds off from qualifying for the finals in London 2012. At the 2015 world relay championships, Gatlin – one of the world’s best in the 100 and 200 — provided Tyson Gay and Ryan Bailey the position to build a lead so big that not even Bolt could overcome it as the U.S. upset the favoured Jamaicans. 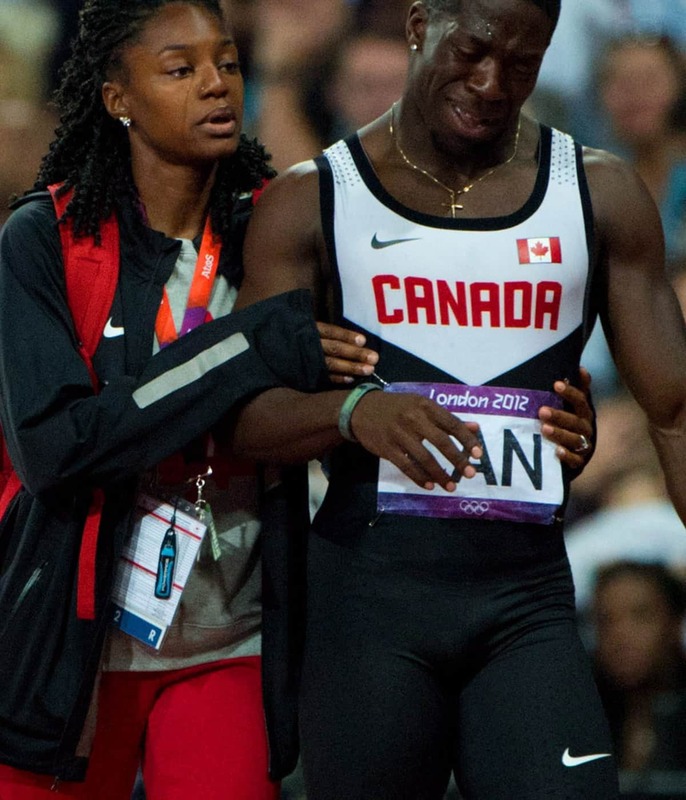 Canada was the beneficiary of another poor exchange at the 2013 world championships when Great Britain’s Harry Aikines-Areetey passed the baton to James Ellington beyond the permitted exchange zone on the curve — an infringement of the rules — resulting in their disqualification and elevating the Canadians to bronze. This is run completely on a curve and requires being able to maintain a high velocity and smooth mechanics throughout the entire leg. At approximately 80 metres, it’s the shortest of the four legs, so a sprinter with a higher stride frequency (speed = stride length x stride frequency) would be an asset in such a short distance. Rodney is a 200 specialist and an Olympic and world championship bronze medallist in the 4x100 relay. He says that running the distance in college made him best suited and prepared to run the turn on the third leg on Canada’s relay team. You need to be mentally sharp and focused. As Rodney learned at this year’s IAAF world relay finals, sometimes you can be too eager to get off and running, as the Canadian dropped the baton exchange from Brown. The anchor leg requires great composure and competitive fire. At this point of the race, the last runner may have to play some catch-up or fend off the rest of the field depending on their position. The runner should receive the baton as close to the 110-metre mark as possible to give him time to reach the acceleration phase and maximize his top-end speed in the last 100 metres. Bolt and De Grasse (before his injury) aren’t the fastest starters and so receiving the baton as early as possible within the exchange zone is crucial for the finish of the race. Canada captures Olympic bronze in men's 4x100-metre relay. As you can see below, with Bolt right by his side, Gatlin loses his composure in the final exchange of the 4x100 event at the 2013 world championships. He narrowly avoids a collision with the Jamaican star but the damage is done. A dead-even race is blown wide open and the Americans are left behind the dust. CORRECTION: An earlier version of this story listed Akeem Haynes, Aaron Brown, Brendon Rodney and Andre De Grasse as the authors. In fact, this story was written by CBC Sports staff.